Before and after of the 5th at Sweetens Cove GC in South Pittsburg, Tennessee designed by King Collins Golf. Perhaps it should have been obvious that the second installment of Zac Blair’s The Riinger at Sweetens Cove was going to be special. Early on Friday morning, legendary quarterback Peyton Manning was seen standing alone not far from the iconic Shed. Manning was at the King-Collins masterpiece to promote his involvement as an investor, along with tennis great Andy Roddick, in the Bronson Companies plans for the future of Sweetens Cove. 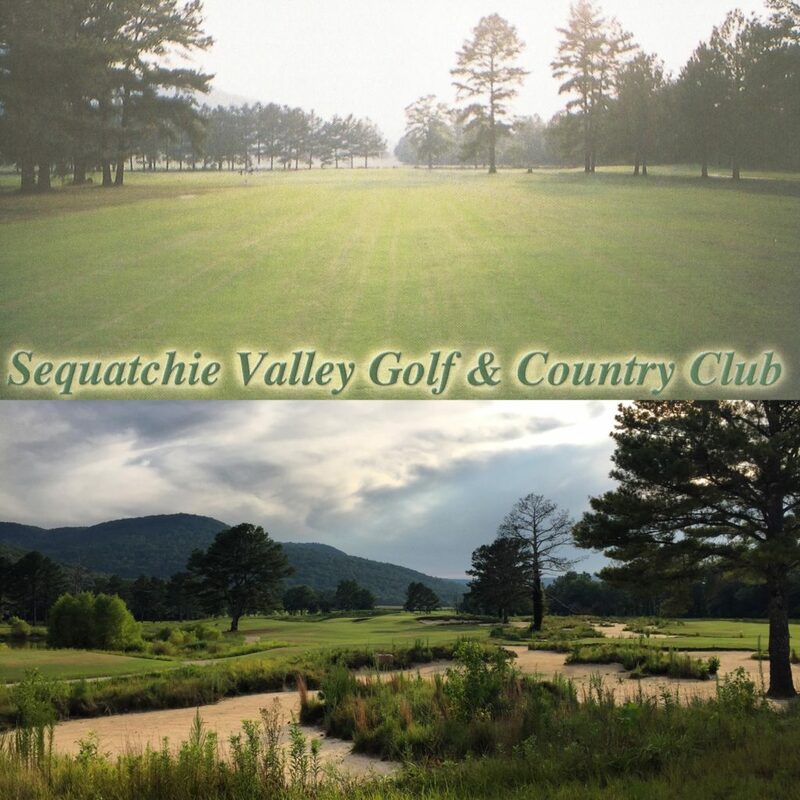 In many ways, this was the final culmination of a long journey started at the old Sequatchie Valley Golf & Country Club by Rob Collins and Tad King in 2011. The continued existence of one of the most special places in golf (that was within a day of shutting down altogether on more than one occasion) was finally secured. If you love fun golf, brilliant course design and good people like Rob Collins, then you should be happy with this news. The Riinger unofficially got underway on Friday after Rob teed off on the first with Peyton Manning and the investment group. 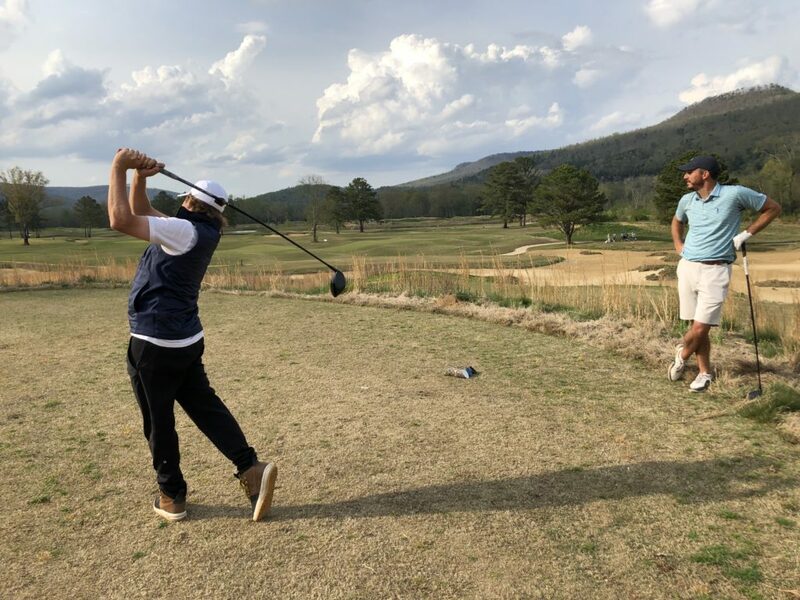 Following this prestigious group, a 32 man hickory club match play tournament called the Tom Stewart Trophy served as The Riinger warm-up event. Ironically, the championship ultimately came down to a final match between No Laying Up’s own D.J. Piehowski and Neil Schuster. Young Neil battled through some very early good play by DJ Pie to win the trophy, who was ultimately done in by the water on the difficult 6th. ZB and Soly of NLU on 1. The Riinger raised money for junior golf. Unlike any big golf event that I have played in, ZB structures The Ringer to celebrate everything that is enjoyable about the game. It fits perfectly with the wild brilliance of the Sweetens layout. You hear laughter on almost every hole, for both good results and unfortunate ones. It is the essence of fun competition and Zac has improved on any perceived shortcomings from the inaugural Ringer. He is organized and detail oriented to a fault, as well as just being a great guy. In The Riinger, you can try shots that you’d never consider playing in other tournament formats. With the set up, Zac encourages hole in ones and eagles in equal measure with doubles and triples. Its no surprise that Soly, Tron Carter and Luke Davis all made aces during The Riinger, taking home beautiful crystal for each one. Nothing is celebrated at Sweetens Cove like a hole in one. (even fake ones) Legendary Sweetens Cove member Trey Moon was on hand to get a video of Tron’s ace on the famous 9th. 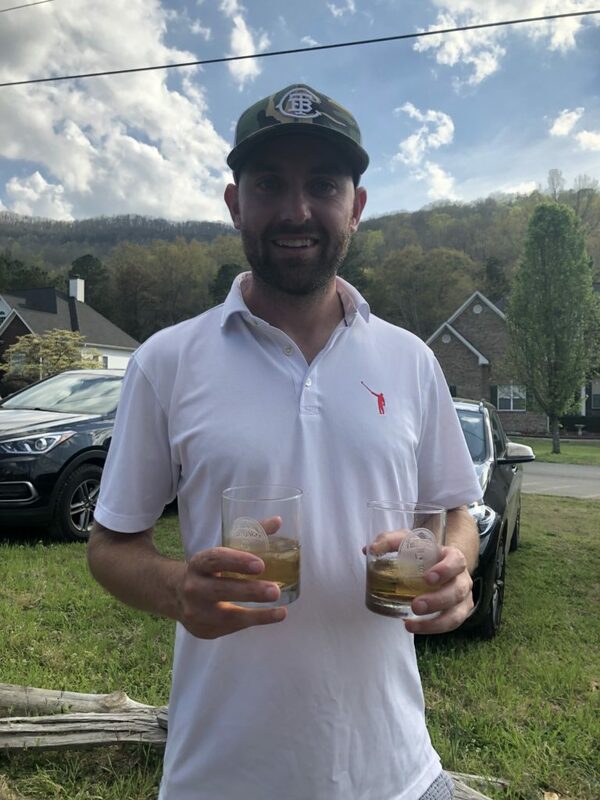 Tron Carter of No Laying Up celebrating with two-fisted crystal after going an improbable ace-eagle on the 9th and 1st. For the overall Ringer title, its was a clean sweep by the No Laying Up guys, with Chris “Soly” Solomon winning Gross and Tron taking the Net. With Soly’s win, he became the first back to back Ringer champion in tournament history. 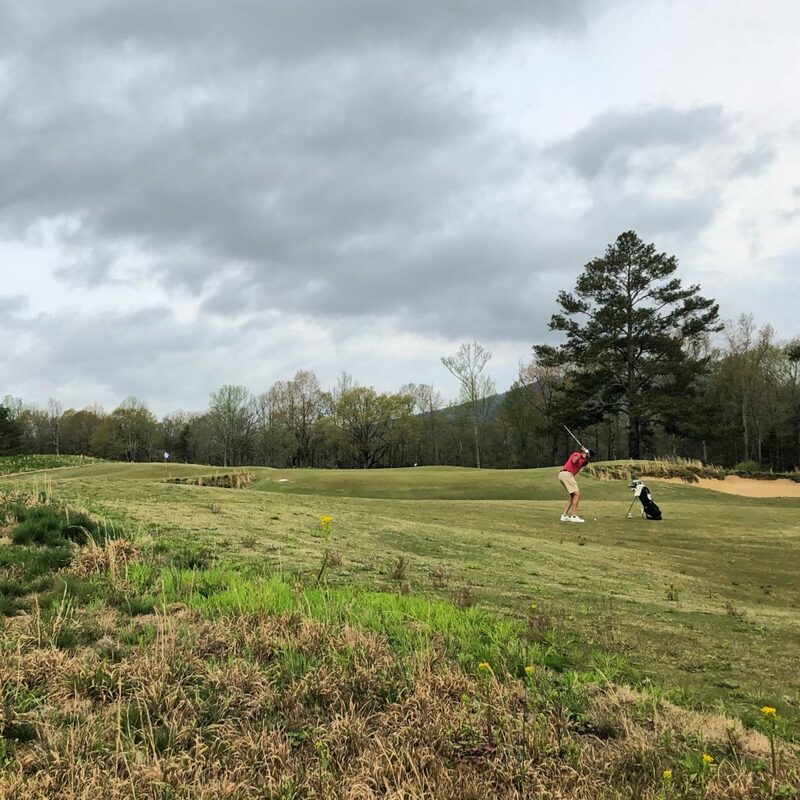 While there has been some grumbling among the handicap committee, its hard to begrudge these titles to two guys whose love of Sweetens Cove Golf Club is obvious from the minute they set foot on the property on Friday. Other format winners included club designer Tyson Lamb, SCGC member Kevin Moore of Athens, GA and Seattle executive Greg Milam. All in all, it was a quite a diverse and talented group of winners. Phil Landes, aka Big Randy of No Laying Up, with the approach into the famous 5th at Sweetens Cove. On a personal note, I had some great playing partners. I played in the hickory event with Bret Waldrep, a very good player from Alabama. Bret played flawless golf with the hickories, which is not easy to do. Patrick Boyd was also in our group for the Tom Stewart Trophy. If you can’t have a good conversation walking a golf course with Patrick, then there is something wrong with you. Andy Johnson (The Fried Egg) yelled in delight when a shot was played in our group off the slope on the left side of number 1 and almost went in the hole. Andy is such a fun and knowledgeable guy to play golf with. Chris Solomon of NLU was the consummate gentleman and is a great golfer. We had a great conversation most of the way around the course, covering a wide variety of topics. I am always struck by how much he loves Sweetens Cove. It was fun to play with Tyson Lamb again. He is also a very good player, shooting 31 in the 4 Club Challenge. I played 18 with Ryan Carey of Green Jacket Auctions, who probably got tired of my golf history questions by the 5th hole. Finally, Big Randy (Phil Landes) of No Laying Up was in my group for the 18 hole team competition. If I have ever played golf with a nicer gentleman, I cannot recall it. We had a ongoing discussion about Scotland and golf literature the entire round. It’s a dialogue that I hope we can continue in the future. People like Zac Blair, Rob Collins and the NLU guys have made golf fun again. They understand that there is, in fact, enormous chance in golf. The fact that Sweetens Cove and an event like The Riinger exists is proof of that. Love this. I love that little ole Athens Ga was represented so well. I love the entire idea and it makes me love the game more knowing these kinds of things exist. Thanks Scott. I appreciate you taking the time to read this.